Fort Collins, Colo. • For a few moments, Colorado State lived every underdog’s dream finish. The winning score even went up — briefly — on the scoreboard only to be wiped out by reality. Collin Hill’s apparent 34-yard touchdown pass to Preston Williams with no time left was negated by penalty, allowing No. 14 Utah State to escape with a 29-24 victory Saturday in a wild, stunning finish to a game played in snow and freezing rain. The Rams, denied in their bid for their first win over a ranked team since 2002, were flagged for illegal touching after it was determined that Williams had stepped out of bounds and was the first to touch the ball when he came back in bounds and made the leaping catch between defenders in the end zone. The call set off a bizarre scene in which the celebrating Rams team suddenly went silent on the field with the sideline for Utah State (10-1, 7-0 Mountain West) going from dejection to jubilation in winning its school-record 10th in a row. Hill understood the swirl of emotions from the other end of the spectrum. The teams scored two touchdowns in the last 1:36 of the game. Jordan Love threw a go-ahead 33-yard touchdown pass to Aaren Vaughns with 43 seconds remaining, the first offensive touchdown of the day for the Aggies, who came in with the nation’s top-scoring offense, averaging 51.3 points per game. That score came on the heels of Hill’s 17-yard touchdown pass to Williams with 1:36 remaining. Hill, who had two interceptions returned for touchdowns by Aggies defenders, came back to throw for the score two plays after Deven Thompkins muffed a punt that was recovered by Colorado State at the Aggies’ 20-yard line. Trailing by 10 points, the Rams (3-8, 2-5) drove nearly the length of the field and pulled to within 20-17 on Hill’s 9-yard touchdown pass to Williams with 10:36 remaining. The drive was kept alive by punter Ryan Stonehouse’s fourth-down pass completion to V.J. Banks. Safety Aaron Wade’s 95-yard interception return early in the second quarter stood out as Utah State’s lone touchdown until linebacker Jontrell Rocquemore picked off another wayward pass from and returned it 32 yards to give Utah State a 20-10 lead with 2:37 remaining in the third quarter. Dominik Eberle kicked his second field goal, a 26-yarder, earlier in the third to break a 10-10 tie. Utah State’s high-powered offense made little headway in the first half and the Aggies led 10-7 at intermission because of defense and special teams. Colorado State was poised for an early score when Wade came up with his team-leading third interception of the season. He caught a deflection off the hands of Williams and sprinted untouchded down the right sideline to match the fourth longest interception return in Utah State’s history. Utah State’s first scoring drive stalled on a third-down incompletion and Eberle came on to kick a 23-yard field goal, the only first quarter score. Utah State: The Aggies' offense finally came to life by scoring a touchdown in the waning moments and it was just enough for the win after a penalty call negated the Rams' last-second score. 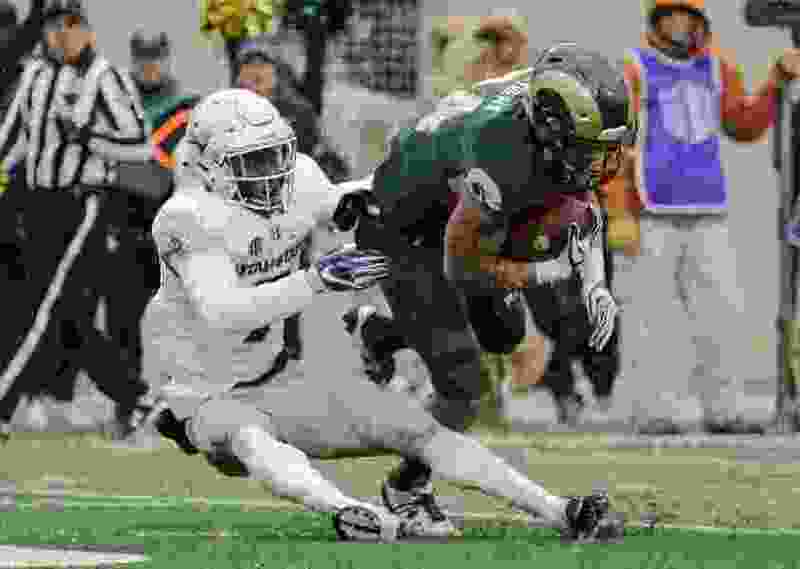 Colorado State: The Rams nearly pulled off a major upset by stifling the nation's top-scoring offense. It just wasn't quite enough. Utah State: Concludes regular season Saturday at No. 23 Boise State with the Mountain West Mountain Division title on the line. Colorado State: Rounds out the season Saturday at Air Force.